Indian Military : Service Benefits and Issues: Oh thank you Mr Gupta !!! Oh thank you Mr Gupta !!! We are indeed grateful !!! By the way, the Commonwealth way to spell is 'defence' and not 'defense'. Thank You. Trust a baniya to make money on dead bodies!! Now he wants to make moneyo obituaries and wants to make it sound like he is doing a favor. What a sick bharat bhushan! Mr Shekhar Gupata's infamous article castigating services might not have yielded him the expected goodies and now that he want to salute the soldier. It is of course a welcome move. As a renowned journalist he may put some effort to understand the services problem rather than projecting a bad picture of an issue which ought to have been addressed atleast two decades back. Every time all these years services have maintained a very dignified posture,believing that wisdom will prevail at some time. But unfortunately in India only crying babies gets the milk. Still the Service chiefs approached it in very magnanimous way. Finally only managed to get the status co of fifth pay commission and benefits are yet to be implemented even after six months of implementation of new scales. The status issue is still a distant dream. Can Mr Gupta explain why Armed forces in India need not be given parity in rank with their civilian counterpart??? What way Service people are inferior to civil services??? Can he get an answer for these!!!!!!!!!!! 'Living Soldiers' also need some 'Saluting'..does he realise that? The message is "Lick the boots of your political masters and get rewarded". Even mention of this character gives me a nauseatic feeling. Better ignore such clowns who do everything as a buisness. I personally hate this gentleman(if we call him so...i dare).....He is shameless character who serves the establishment.Ignore his this stunt and tell him to mind his business. OH, Mr. Gupta, NOT AGAIN!! STOP INSULTING THE SOLDIERS. THAT IS THE BEST TRIBUTE YOU CAN PAY TO THEM. Dear Maj Navdeep. Pl. fwd all the comments to Mr. Gupta. WE DO NOT NEED SYMPATHY FROM PEOPLE LIKE HIM. Mr Gupta, you are one person I love........ to hate ! !we do not need any thing from you..you've already done enough of disservice to us .....I shall never read your newpaper again. For the bloodsuckers of India/Bharat/Hindusthan the good soldier has always been `dead soldier'. let us all resolve to teach such biased journalists a lesson by not reading this paper and not subscribing to their so called service for the soldiers. Brother officers let us spread the message. let us all email as many friends as we can. its time we woke up. It is a well known adage in even the West (where they spell it as Defense). "SHOW SOME RESPECT TO THE VERTICAL MAN ALSO INSTEAD OF THE HORIZONTAL ONES". Ever since I have hung my boots, I can only marvel on the tenacity and fortitude of the youngsters who are alive and are continuing to serve this ungrateful country with all its wretched politicians and Babus. I hope you can make some amends for what yellow journalism you have been typecast for. What causes this change of heart ? Did'ya have a bypass too ?? Guptaji must be having some concessions from the UPA government in mind.That is how he is keen on concessions to the dead soldiers in obituary and writing against living soldiers.God give him serenity. Guys like him are a disgrace to the Nation, enjoying patronage in the form of free Sarkari accommodation etc. How can we expect any meaningful unbiased reporting from such a lot. the awareness about dues to an soldier shld be attributed to the Navy chief. I am indeed thankful to him for making nearly all rank and file of the armed forces think alike. Another important point is pending as to wearing of Badges by all rank of the armed forces should be same pattern.!!!! It appears that one of comments on badges of ranks seems not observed by anyone. My suggestion was for a change of the existing badges of ranks of the Army. We should resort to a pattern similar to Navy . It is high time for our Defence Forces to have a uniform Badges of Ranks. Could be with slight modification to be come more attractive. Similarly our JCOs badges of rank also need a change. After changing the oficers rank to a pattern akin to Navy, we should remove the red stripes of JCOs badges of rank. A Nb/Sub and equevlent should have one star with no red sripe. A sub, two star with no stripe, a Subedar Major three stars with no red stripe, akin to that of a DySP. In fact the Sub Major is equevelent of a DySP. Similarly the Star Plate in the Staff Car/Jeeps should also bechange. The colour should be "Red' in uniform. All major unit Commanders should be allowed to put one star, a Brigade Commander two, a Divisional Commander three, a Corps Commander four, an Army Commanmder five and Chiefs Six. This is likely to put the Police at the corect place. When only few defence people read the paper espoucing journalism of courage these days after its shameful editorial-what use would be the free obituaries in defence circles? 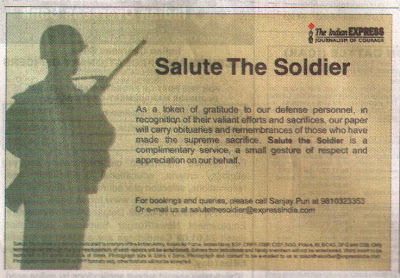 The Indian Express should rather be expressing its solidarity with the bureaucracy by carrying their obituaries & even marriages ads free. I am a baniya too and a serving officer in indian navy. Its a humble request that no comments be made against a caste or community because it is against the service ethos. would be grateful if you could kindly block such comments. PPL, please refrain from making such comments. A community can never be broad-brushed. Why give any importance to Shekhar Gupta or Indian Express. The Army should avoid calling him for any press conf etc, rather ban Mr Gupta from interacting with the Army. other services try to copy armed forces because we are the best and worthy of emulation. Every time we create something new we will be copied. It means that changing our rank badges every time will only be a temporary solution. Police forces do not have as many ranks as we have in armed forces, hence they should follow different system. case must be taken up at highest level. Though I hold this opinion but have serious doubts since combat dresses and names like commando and special forces are being freely used by PMF in different states but nothing has been done about it. I implore you all to avoid being cynical and derogatory. All fallen soldiers deserve dignity. They died for a cause that had no caste,colour,creed or religion. They died, not for hatred of the adversary, but for the love of ALL their brethren. THEY deserve respect from all of us. Don't deny them that. There is a serious problem regarding pay fixation of Defence re-employed pensioners of LT COL s rank in the Civil Govt jobs. They have been taken in pay band 3,where as they were drawing salary in pay band 4. Could you clarify how their pay would be fixed. request help out such cases as one would like to have last pay(PB-4)protected with full pension(less offset) deducted. This newspaper as is the case of most of Indian Media is an extension of the corruption that inhibits the Indian Society... someone said just a few months back "this country doesnt deserve the soldiers it has"... Mr Gupta should stop 'faking it' ...we dont get a high by gaining such favours.